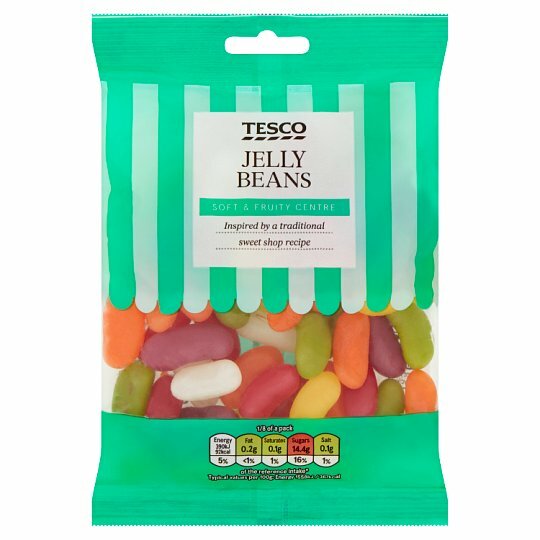 Assorted fruit flavoured jelly beans. SOFT & FRUITY CENTRE Inspired by a traditional sweet shop recipe Our confectioners have been creating classic sweet treats in the UK for more than 50 years. We take traditional recipes and evolve them for today, so our sweets are tasty as can be, with absolutely no artificial flavours or colours. INGREDIENTS: Sugar, Glucose Syrup, Maize Starch, Citric Acid, Water, Flavourings, Palm Oil, Stabiliser (Acacia), Colours (Lutein, Anthocyanins, Carotenes), Safflower Concentrate, Glazing Agent (Carnauba Wax), Spirulina Concentrate, Coconut Oil, Sunflower Oil.